Justice for The Moria 35! 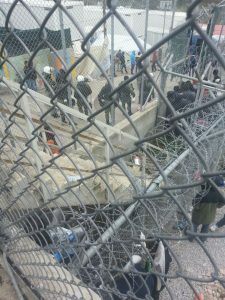 On the 18th of July 2017, prisoners in Moria held a peaceful protest outside of European Asylum Support Office. 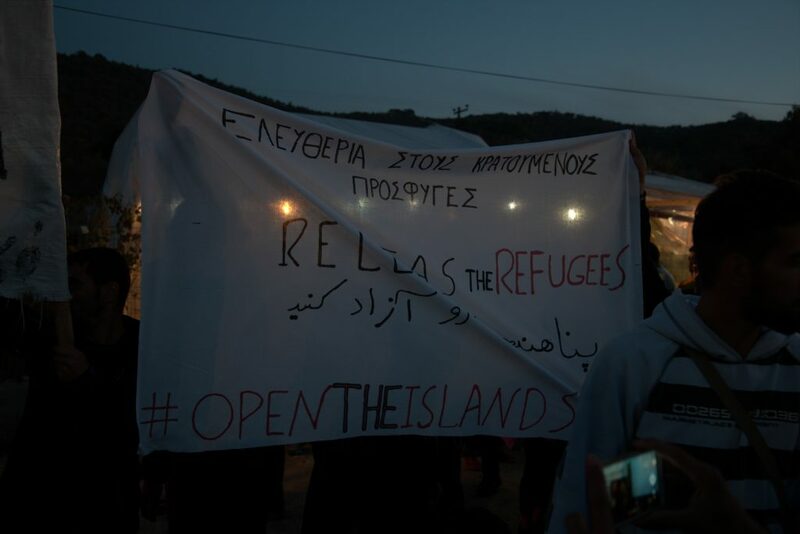 Their demand was simple: freedom of movement for everyone who has been trapped on the island for more than six months, and humane living conditions. All of the 35 people arrested and accused of crimes, seem to be chosen out of coincidence. They are also accused for exactly the same crimes. During the arrest, the police used more violence than needed including teargas. One of the accused refugees was taken to hospital where he had to stay for a week. To give everyone a chance, Legal Center Lesbos is crowdfunding in order to be able to provide the legal support needed for the trials. They are running out of time, so HELP THEM HERE, NOW. From Tuesday to Thursday this week there were once again violent clashes erupting between different groups inside of Moria camp. According to local news 15 people needed treatment in the hospital. As far as we know at least some of them were innocent bystanders. Furthermore several tents burned, leaving innocent people without shelter. We are still waiting for news if the injured will recover. The rumors that three people died in the hospital is not officially confirmed nor denied yet. A huge police raid on Thursday followed this violence. Riot cops swarmed the camp and arrested several dozens people. Targeted were refugees with the second rejection on their asylum claim. Many arrested were brought to prison. We condemn this police action and we expect and fear that many will be held in prison until being forcefully deported back to into a horrible Turkish detention center. It is time that the government takes responsibility. They create the conditions that fuel the recurring violence that every time endangers innocent people and gets families, children and other bystanders injured. It is time to open the islands. Stop deportations and freedom of movement for all! No Border Kitchen Lesvos currently supports 450 refugees to cook and subsist autonomously, at a regular cost of 20€ per person per month. We are a self-organized group of activists with and without papers from all over the world, with the shared aim of overcoming the borders and restrictions that impede freedom of movement. We fight together for a world where we all recognized equally as humans. Our project is entirely volunteer run and we do not receive any regular funding. In two weeks our bank account will run empty and we will need your support to continue our work! Since the closure of the European borders in 2015, the situation on Lesvos has been deteriorating. The official camp Moria is with nearly 7000 inhabitants more than three times over its capacity. Solely in the last three months, 8000 people arrived by boat to Lesvos. Basic necessities are scarce and people’s basic needs for shelter, clothing and food are not met from the official structures. The quality and quantity of the food in the official camp is absolutely insufficient. Some people have been forced to live in the official camp in this horrible conditions for 20 months now. That’s where we step in, unbureaucratically filling some of the gaps the rotten European asylum system creates. Food provision is by far the area in which we spend the majority of our money. Every month we support more than 300 people with food boxes which enable them to live and cook autonomously at a cost of 3,60 € per person per week. For most, our support allows them to live outside the miserable, state-run camp, and making their homes in their own flats and squats instead. The demand for the boxes is huge and we currently have a long waiting list. We always hope to be able to support more people in future, but even continuing to support those we already provide for demands more funds than we currently have! For the people we cannot currently support with food boxes, and for those who don’t have cooking facilities, we also organise a daily distribution of hot food of 200 meals a day with a cost of 0,30 € per meal. This is also important as an opportunity for meeting each other and chatting over a nice cup of rice and salad, and building networks of solidarity on the island. To make all of this happen we buy monthly 1000kg potatoes, 600kg onions, 640kg tomatoes, 800kg vegetables, 1000kg rice, 500kg pulses, 1000kg of flour, 500kg sugar, 600l of oil, 80kg of tea, 80kg of coffee and 40kg of salt, plus spices and toiletries. Delivering food boxes and meals involves a lot of driving which means we spend a lot of money on fuel, car repairs etc. At the moment we are also readying the kitchen for winter and so urgently need to buy building materials. If you cannot donate yourself, you could help us by spreading the info about NoBorderKitchen and sharing this crowdfunder on Facebook and twitter! Follow our Facebook (“No Border Kitchen Lesvos”) and our Twitter (“@noborderkitchen”) for information for updates on the work your support will enable. 14 protesters are still detained at the pre-removal center in Moria camp. Only two people were released. Among the 14 detainees there is one cancer patient and one suffering from epilepsy. We are very worried that their health will deteriorate if they are not immediately released and can access sufficient medical care outside of the prison. All of the 14 arrested protesters are North-Africans and therefore subjected to an accelerated asylum procedure. We expect that they will be detained for the entire course of their procedure and then deported. This accelerated procedure is very biased and does not guarantee that each persons case is considered properly. All of them will most likely be rejected on the prejudice that all North-Africans are “economic migrants” and do not deserve international protection. In the last days IOM staff has been visiting the people in prison and pressured them to sign for so called “voluntary return”. The choice they are given by IOM is barely a choice though. Either they sign, spend months in prison and will be deported….or they do not sign, spend months in prison and will be deported. What is most outrageous about all of this is that their arrest itself was based on a lie. They are charged with illegally occupying saphous square by putting tents. Just… there were NO TENTS! We are at the moment collecting evidence that can prove that the accuse is simply wrong. Will it change anything? Probably not. Even though the protesters arrest is based on a lie, we do not expect them to be released from detention. In the end, on Lesvos, the law is not respected. Human rights are not respected. The only thing that seems to count is to get as many people as possible deported as fast as possible. We demand the release of the remaining 14 protesters. We demand that the two sick people can access sufficiant health care outside of the prison immediately. We demand that the charge of illegally occupying the square is dropped. We demand freedom of movement and a life in dignity for all! Two brothers from Nigeria who made the deadly crossing from Turkey to Lesvos in a rubber dinghy were immediately detained in the pre-removal prison inside the so-called “Hotspot camp”, Moria. For almost three months they were isolated from society, adequate legal assistance or support structures. All refugees from countries with less than 33% acceptance rate (which are more than 28 countries including Syrian single men) can currently be detained immediately after their arrival on Lesvos, for the entire duration of their asylum procedure. While the two brothers were held in detention, their asylum application was rejected twice under the fast-track border procedure implemented on the Greek islands since the EU-Turkey statement of March 18th 2016. It has been repeatedly pointed out by the European Center for Constitutional and Human Rights and lawyers such as those from the Legal Centre Lesbos that the fast-track procedure tramples roughshod over human rights. In practice, individuals are targeted because of their nationality and stripped of their legal right to a fair and proper asylum hearing. Together with eight fellow detainees, the two brothers were deported back to Turkey on November 30th by ferry from Mytilene. They only experienced Europe from behind the barbed wire and blank walls of a detention centre, guarded by policemen subject to a constant feeling of isolation and suffering inhuman treatment. “The conditions in the closed Section B of Moria Centre [are] particularly poor and could be considered as inhuman and degrading,” one Council of Europe researcher reported. Inmates are stripped of their personal possessions, denied blankets and often live among flooded sewage. Some can only be seen by a doctor at the discretion of the prison guards. Thanks to these conditions and a lack of medical support, one of the brothers got seriously sick. A video of his deportation shows that he was not even able to walk on his own when he was brought handcuffed on the ferry. 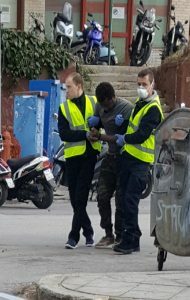 Obviously, this condition was no reason for FRONTEX and the Police to postpone his deportation – as we have seen in several similar incidents across recent months. Many of the people who are deported from Greece to Turkey will, after the detention period, eventually be deported once again to home countries that they fled due to persecution in the first place.. The story of the two brothers is just one example out of thousands, as people flee suffering only to face the brutal detention and deportation politics of this so-called bastion of human rights, the European Union. “Concerned citizens” and angry shop owners formed part of a 40-strong fascist mob at Saphous Square last Tuesday, gathered in an attempt to evict refugee protesters from their month-long occupation of the site. They were soon joined by police. After extensive negotiations between the protestors, the mayor, and the police, the protestors agreed to pack up their tents. Verbal abuse and the threat of physical attack from the surrounding mob left the protestors with little choice but to do so. They were promised a night in a ‘warm place’ in return, but this was never delivered, and instead of decent government-provided shelter they were brought to sleep in tents at House4Humanity. Following this, the protestors returned to the square the next morning, welcomed again by the fascist mob. Police in full riot gear showed up to separate the parties and to begotiate again. After some time the protestors were offered a three-day stay in Pikpa, an independent refugee camp, with the obvious question of what will happen once the three days are up left unanswered. The protestors announced to return to the square if not offered any solutions after this time. During the negotiations the gathered fascists shouted violent verbal abuse, directed at the protestors and those in solidarity with them. At one point this broke out into a physical attack, with 25 men attempting to assault 4 women attending the protest in solidarity. In the end, luckily, no one was hurt. Currently Saphous Square lies empty, save for a handful of bored police. For now we wait to see where this leads us, with a verdict promised by Saturday. The importance of the Saphous Square protest, and the need for it to continue, was demonstrated again this morning. Despite one individual’s lawyer appealing his deportation order, we learned today that this man remained on the list for deportation to Turkey. The deportation has been stopped for now, by pressure from the lawyer, activists, and journalists on the police. However, the question remains: what if this individual had not been one of the lucky few represented by a decent lawyer? Most likely, he would right now be in a Turkish detention centre, and in a few months, on a plane back to Kabul. Nearly every week between 7-20 people are forcefully deported to Turkey. The situation is almost impossible to monitor, as access to the prisons is strictly limited to lawyers and close family members, and there are nowhere near enough lawyers on Lesvos to provide access to legal aid for the detainees. We know that today was not the only attempt to illegally deport someone, and we can be sure that the cases we hear about are the very tip of the iceberg. Today there is general strike and a demonstration called by the major. Although they demand the refugees to be able to leave the island we should not follow a racist argumentation that demands to decongest the island because refugees are a “burden” for the local population. Our demands are to open all borders and decent living conditions for all people, on the islands, on the mainland and in the rest of Europe. Open the islands- Open the Borders-Free Hesam! The occupation of saphous square in Mytilini is now happening for the 27th consecutive day. For almost one month now refugees from different countries of origin, different age and gender have stood together against the conditions on the island and for their right to freedom of movement. On Tuesday afternoon, the protesters called for a demonstration in front of Moria. 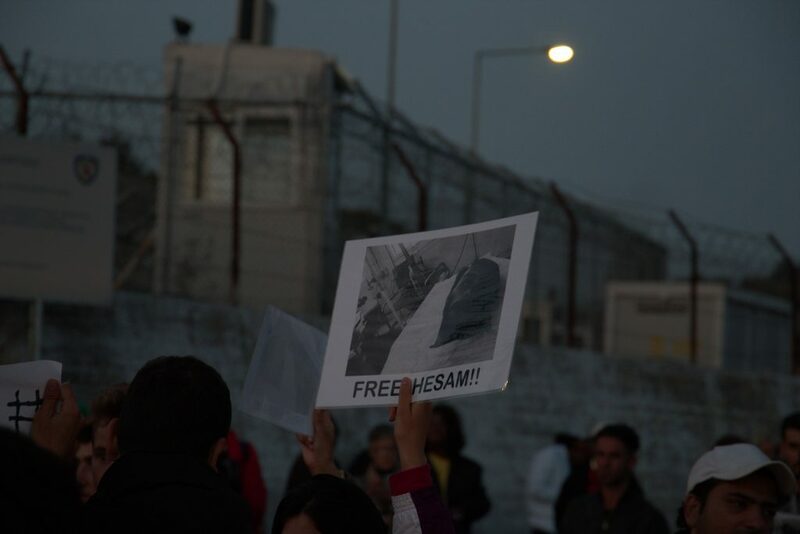 The reason for the protest was the arrest of Hesam, one of the occupants of saphous square. His asylum was rejected and he faces deportation to Turkey and then Iran. He is afraid that he will face further religious persecution upon his return to Iran. At 4.30 in the afternoon around 30 people gathered at first in front of Moria. 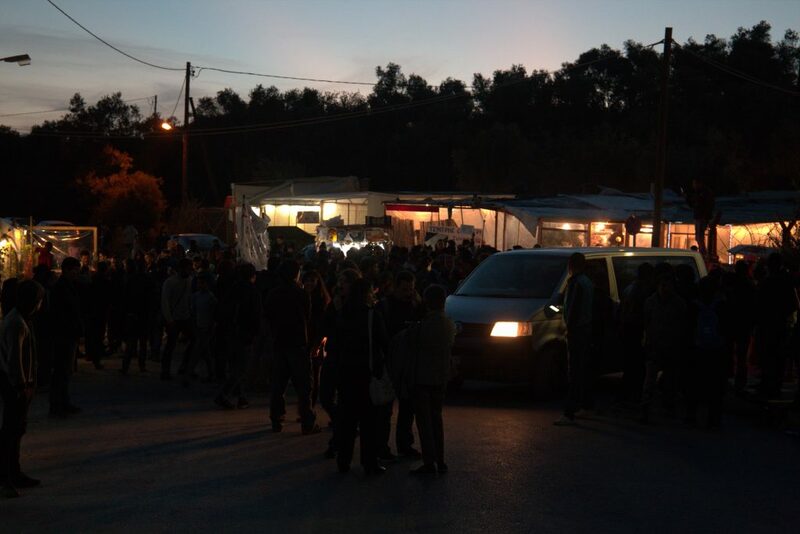 Quickly they were joined by many people living in Moria camp that formed a loud and powerful yet peaceful gathering.